Professional LED Lighting that’s easy to use and works right out of the box. Monster Illuminessence is easier to setup and use than Bluetooth or Wi-Fi products on the market. The new Monster Illuminessence line includes kits for large rooms, small rooms, light strips, bulbs, and longer power extension kits. Simple Monster Illuminessence Multitouch Remote Controls It All! With Monster Illuminessence, the simple multitouch RF remote control puts all the color-changing lighting power in the palm of your hand, allowing you splash light and color all over your home in an instant, turn the lights on and off, or even dim them all at once for a special effect. You can also select preset programmed modes like “Sunset” or “Lounge” for relaxation, of “Club” for parties – and the lights change automatically to set the mood. Special modes for holidays like Halloween, Christmas, and even the 4th of July help you celebrate in bright style! Additionally, users can opt for a pure “White” which delivers bright white light for everyday use. With Monster Illuminessence, LED lighting is easy to install and easy to use, allowing versatile, fun and useful lighting at the touch of a button. And because the system is completely modular, you can choose exactly the kit that best fits your room size. Each kit includes a different combination of LED color-changing bulbs and LED strips to suit your needs. Simply screw in the bulb to any light fixture, remove the adhesive on the LED strip and stick it below your bed, bar, kitchen cabinetry, or anywhere you want to add instant mood and ambience. Best of all, it’s easy to expand lights and rooms with additional Monster Illuminessence kits. You can pair up to four Illuminessence remotes with up to 30 different LED bulbs or strips in each group for the right light throughout your home. Celebrating its 40th Anniversary, Monster® has been a catalyst for innovation and big ideas. After discovering that cables in hi-fi systems influenced the sound, Head Monster Noel Lee developed Monster Cable, which became an immediate hit with music lovers. Monster® went on to engineer the sound of Beats® headphones, and has now become the world’s leading manufacturer of high-performance headphones, all featuring Pure Monster Sound™ technology. Today, the company offers advanced connectivity solutions for professional musicians, home entertainment, computing, mobile and gaming, as well as high performance AC Power and conditioning products. Monster® continues to lead in innovation, with over 500 Patents granted and 100 patents pending worldwide, offering more than 5,000 products in over 160 countries. Monster® also prides itself in helping those who are in less-than-fortunate circumstances through Monster Cares. Above all, Monster® does what it does Because the Music Matters. We recently received samples of their new lighting, did some testing in different environments and are quite impressed by the quality and ease of use of the new lighting products created by Monster. I was first exposed to Monster products when I worked at Circuit City in Car Audio in the late 1980’s..they certainly have come along way and have done quite well for themselves! 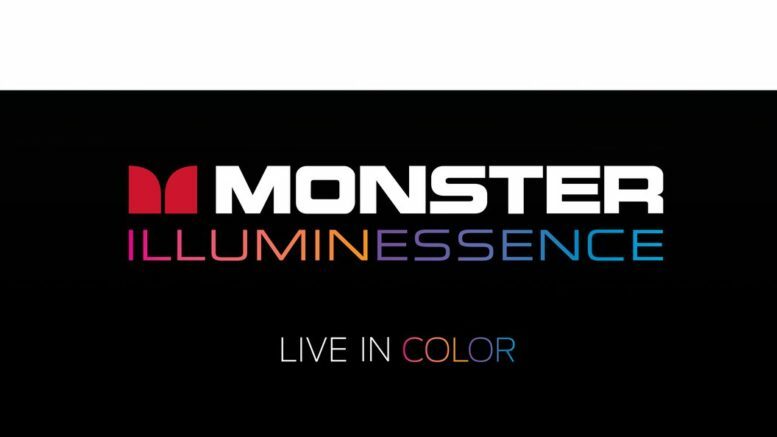 Be the first to comment on "Monster Illuminessence Color Changing Mood Lighting!"